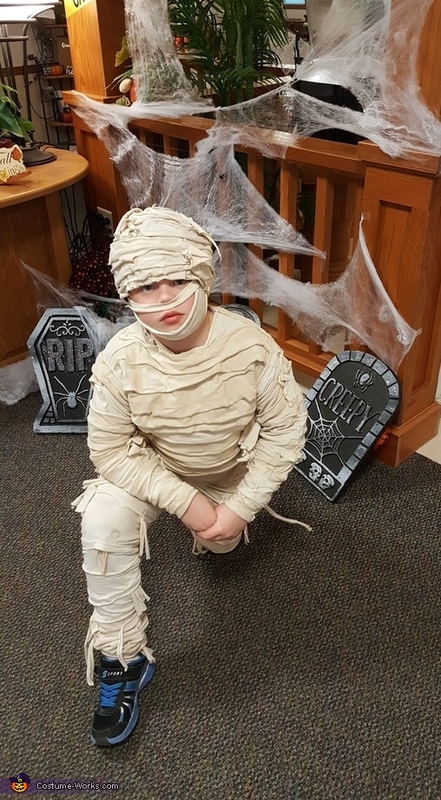 My 7 year old, Tyler, wanted to be a mummy. I have no money in this has I used things from the house. I cut 4 old white t-shirts into strips and then soaked them in tea of about 4 hours. I hand washed them so he didn't smell like tea! I super glued them onto a pair of long johns he had. I attached strips to a stocking cap so he could take it off at school. I occasionally tied knots and left strings hanging to make it look like he's been wearing it for awhile.